2015 Leaf Metal Draft Football once again delivers some of the first autographs of the season's incoming rookie crop. The all-autograph release features a mix of chromium base cards and stylized inserts. Boxes come with four cards, all of which are signed. Leaf is pledging to focus on top offensive players, the ones who typically gain the most traction in the hobby on a widespread scale. Base autographs come with a fairly minimal design that puts the attention on both the signature and the set's "metal." Cards have a variety of numbered color-based parallels. 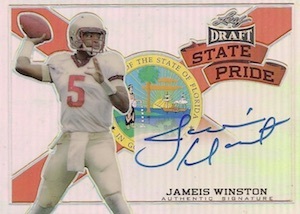 2015 Leaf Metal Draft Football also has several autographed inserts. State Pride returns with the player cast against a backdrop of the state flag of where they played college. Armed and Dangerous is all about top quarterback prospects. Touchdown Kings have a die-cut design that resembles a crown. Award Winner Autographs spotlight players who have amassed impressive trophy collections in recent years. 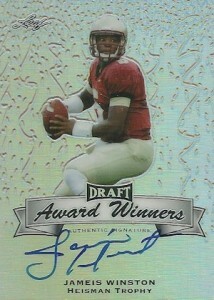 Flashback Autographs use the design from 2014 Leaf Metal Draft. Like the base cards, inserts have a parallel rainbow as well. 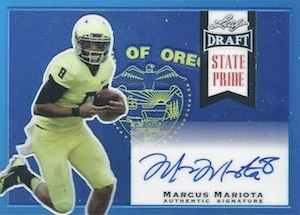 Heisman Trophy winners Marcus Mariota and Jameis Winston autographs are both inserted at a rate of at least one per case. Todd Gurley, Bryce Petty, Blake Sims, Brett Hundley and Garrett Grayson are among the others players Leaf has announced having deals with thus far. Keep an eye out on their Twitter feed for more. 2015 Leaf Metal Draft Football is limited to 350 cases. Ryan — wasnt sure where to ask but will there be any Army All American autographed card this year ? patrick � None were mentioned on the sell sheet. As far as non-licenced products go, Leaf Metal is an exceptional product. the first autos from 2015 rookie class with a reasonable checklist. the design is clean with on card autos. Color variations and inserts aren’t excessive. Everyone has a good chance to get the player your looking for at a low price. I tend to shy away from collegiate issues. Yet, Leaf metal must be magnetized as I was drawn to this year’s issue. I love the chrome/prizm design and my box did not disappoint. J. Ajayi Silver prismatic, Matt Jones blue #/50, Rashad Green State Pride purple #/15, and Josh Harper Green #/10!!! Great hits at a decent price point. Can anyone give me a rough estimate of the value of MELVIN GORDON 1/1 $2000 ROOKIE GOLD SUPERFRACTOR AUTO RC 2015 LEAF METAL DRAFT? Too many undrafted free agents and late-round picks to be worth the hefty price tag. Anyone wanna buy my Damien Berry card? I’ll give you $5 for it.